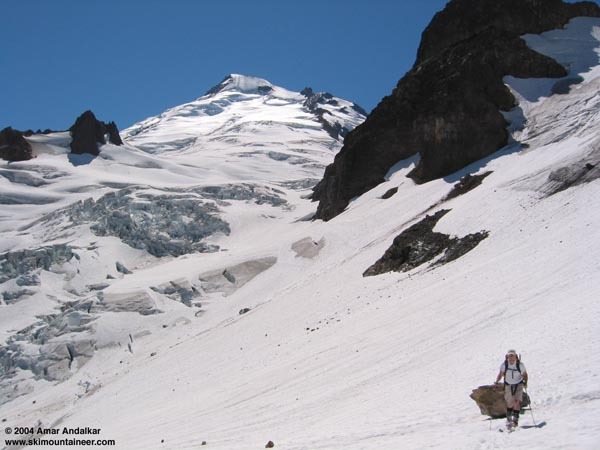 With a forecast for a beautiful Sunday, David Coleman, Paul Belitz, and I headed for the NE side of Mt Baker, hoping to make it out onto the lower part of the Park Glacier. However, from the parking lot at Artist Point we could see that the Park was heavily crevassed, much more so than last year at the same time. Some new snow from Friday's storm was visible high up on exposed rocks near the summit. We debated whether to leave the rope and glacier gear behind, but ended up bringing it and not using it all day. Knowing that we weren't going to make it as far up as we hoped, we started leisurely at 8:30am and hiked the almost completely bare Ptarmigan Ridge trail 5 miles past Coleman Pinnacle and out to the campsites at Point 6079. We left our hiking boots there and skied down the steep slope onto Sholes Glacier, dodging a couple of large open crevasses, and then skied up the gentle slopes to the Portals at 6200 ft. Suncups were quite shallow, generally only a few inches deep and no trouble. Climbing up and over the bare ridge at the Portals, we skied a traverse across the snowfield below until we could see the route ahead. The view of the Rainbow Glacier showed that the route up to Glacier Saddle (6500 ft) and the Park Glacier would go, weaving through crevasses at the right edge just below the cliffs. However, it certainly looked it would be hard to get much above 7000 ft on the Park without serious crevasse navigation. Unfortunately, the snow on the traverse gave out and we ended up above a short cliff band separating us from the Rainbow Glacier. We found a decent spot to downclimb and tossed down our skis, but one of mine didn't stick and nearly took off down the slope. After climbing down to the snow and trying to retrieve the wayward ski, I slipped on a patch of exposed hard gray firn, requiring a Whippet self-arrest. Ugh. After that, the remaining traverse across the edge of the Rainbow didn't look as appealing as taking a run down the fall line towards the toe of the Rainbow. A fair amount of rockfall had fallen across the traverse route, including a few big boulders since Friday's storm. I convinced the others to join me on the descent and we skied a nice but short run down towards the terminus of the glacier, stopping near 5200 ft where the snow gave way to bare glacial ice. Very cool bands and striations were visible on the bare glacier surface. We turned around and skinned back up the snow towards the top of the Rainbow (David and I skied or skinned the uphills all day, while Paul chose to hike on the well-consolidated snow). I stopped below the cliffs near 6100 ft, my desire to go further having been quenched by a malfunctioning heel elevator, misbehaving skins, and the need to eat some lunch as it was already 2pm. David and Paul continued up another 150 ft or so to the edge of some big crevasses and seracs while I ate lunch, hoping to get some nice serac ski photos. We skied down at 2:30pm, angling left across the Rainbow and crossing a short stretch of exposed glacial ice in order to circumvent crevasses nearby. Reaching the edge of the glacier at 5600 ft, we hiked across a rubbly stream and then skinned up continuous snowfields back to the Portals, avoiding the rocky cliffs which had caused problems on the way in. We skied decent snow down the Sholes, and Paul and David hiked up to ski a steep slope along the right edge while I continued down the Sholes to its NE edge where the snow faded to glacial ice near 5600 ft. A quick hike up the edge of the glacier brought me back to the trail at the 6000 ft saddle NE of Point 6079, unfortunately I had to backtrack SW to the campsites to get my boots and meet the others. Since it was nearly 5pm, we decided not to bother with trying to ski any more of the snowfields below the trail or to the north of Coleman Pinnacle, so we loaded up the skis and hiked nearly 2 hours along the up-and-down trail to the car. It was an OK trip, very scenic with perfect weather, but lots of effort to travel about 15 miles round trip with over 4500 ft of gain for only 2500 vertical ft of decent to good skiing. David traverses across the Rainbow Glacier, with the route leading up to the Park Glacier in the background. Our ski tracks are visible between the rock cliffs at right and the cluster of seracs in the middle of the Rainbow Glacier. Click here for an enlarged version of this photo. Good show. That makes 2 years in a row that you guys skied on Baker in August the same day I went down to Timberline. Kind of a wierd coincidence. Had fun though, and got to spend a night down at Breitenbush relaxing, so a pretty good weekend. Hey Amar, I'm about to write you a pm on another topic altogether... Check it! Hey Corey, we planned it that way so you could see that you were truly missing the goods . Seriously, I wanted to go higher, but Paul and Amar insisted on doing more skiing than "traversing". My thirst for crevasse travel was quite high that day! Markharf and I were on the Sholes Glacier the Sunday before. I thought that maybe someone would be interested in a different view of the area in question. what are those two peaks in the background? i'm not familiar with the area. O.K. I'll bite. They are Baker and Sherman. Unless you are refering to the relatively minor peaks to the right (west). Going from left to right, they are Bastile (7,842') and Hadley (7,515'). The following picture, taken the same weekend, is on the Sholes Glacier. Baker is nicely framed by the Portals.